The SFF-8639 is the latest connector design for interfacing a connection to a either a MultiLink SAS drive or a PCIe drive – both Hard drives and SSD drives. It was recently re-named by the SSD Small Form Factor Working Group as ‘U.2’. The SFF-8639 is a revision of the SFF-8680, which is a 29-pin 2-Lane SAS drive interface. The SFF-8639 U.2 is a 68-pin drive interface connector which has higher signal qualities to support 12Gb/s SAS and Gen 3 x4 PCIe, or PCI Express NVMe. 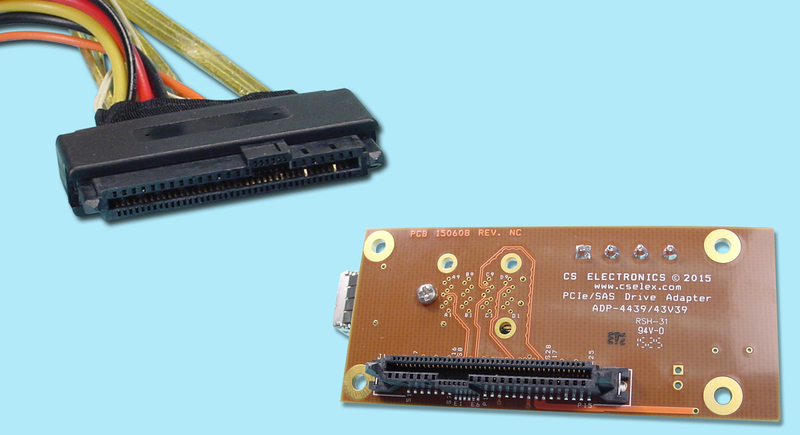 The SFF-8639/U.2 connector can be incorporated onto a pcb “docking backplane” for multiple drives, or onto a single-drive “T-Card” adapters such as CS Electronics’ ADP-4439, ADP-43V39, and the new 2.5″ PCIe NVMe SSD Cable adapter kit – ADP-PCIe-43V39. The SFF-8639 U.2 connector has a total of 6 High-Speed signal paths, however both the SAS and PCIe specifications only ever use up to 4 lanes at any time. It is compliant with the latest 12Gb/s SAS 3.0 spec as well as x4 Gen3 PCIe and SSD Form Factor V 1.0.